revolutionary, Marxist thinker, founder of the Soviet Union (1870-1924). Autograph inscription signed, together with Leon Trotsky. No place or date. 8vo. 1 page. 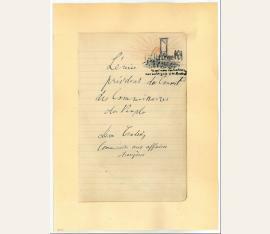 A very fine pair of vintage dark fountain pen ink signatures by both Vladimir Lenin ('Lénine, president du Conseil des Commissaires du Peuple') and Leon Trotsky ('Léon Trotsky, Commissaire aux affaires étrangères') individually on a feint ruled 8vo page removed from a notebook. - To the upper right corner of the page appears an original contemporary pencil and coloured crayon vignette, drawn and signed by the painter J. M. Brossart (the conclusion of the signature a little smudged), the image depicting several individuals standing in a row as they face execution by the guillotine which appears before them, with a large crowd of onlookers in the foreground and a rising sun in the background, featuring the caption, in French, "Ce que nous souhaitons aux soussignés" (translation "What we wish for the undersigned"). To the verso of the page appear ten individual fountain pen ink signatures by various French fighter pilots of World War I, each of them members of the Escadrille BR 209 squadron, including Léon Ribière (1893-1918) and others, a few with additional sentiments and one dated 23rd January 1917. An exceptionally rare pair of signatures by two of the most significant figures in Russian history. Neatly inlaid. - The present signatures of Lenin and Trotsky were obtained shortly after the historic October Revolution, a seizure of state power instrumental in the larger Russian Revolution of 1917. It took place with an armed insurrection in Petrograd and followed, and capitalised, on the February Revolution of the same year, which overthrew the Tsarist autocracy. The October Revolution resulted in the power being shifted to the local Soviets in Petrograd, whom heavily supported the Bolshevik Party. After the Congress of Soviets, now the governing body, had its second session, it elected members of the Bolsheviks to key positions which immediately initiated the establishment of the Russian Socialist Federative Soviet Republic, the world's first self-proclaimed socialist state. 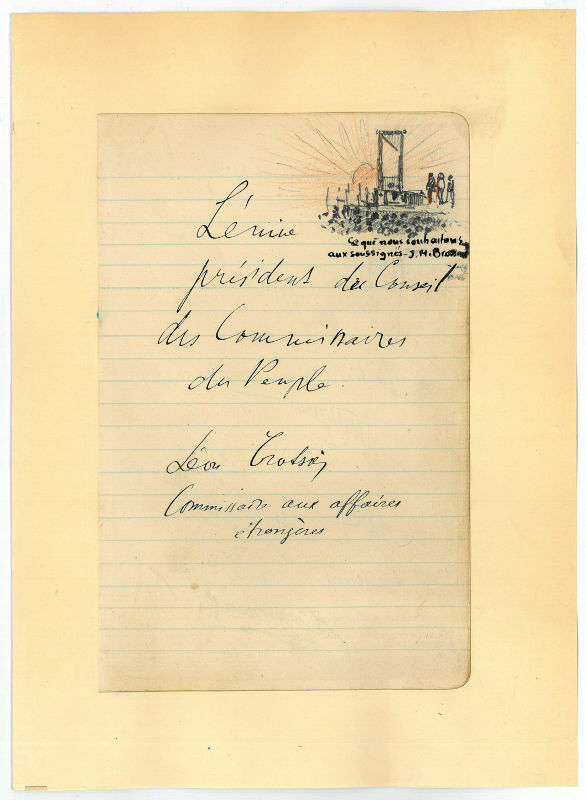 On 8th November 1917 the Congress elected a Council of People's Commissars, with Lenin as leader and Trotsky as Commissar of Foreign Affairs, the positions they have added to the present signatures. - Provenance: The present signatures were removed from a notebook previously owned by Robert de Flers (1872-1927), French Playwright and Journalist who, as the head of a French military mission, travelled to the Eastern front taking him to Romania, Moscow and Petrograd, at which time he obtained the signatures of Lenin and Trotsky. A first hand account of Flers' travels was written by Emmanuel Chaumé (1890-1934) and published by Firmin-Didot of Paris in 1929 under the title La Belle Aventure de Robert de Flers - Russie-Romanie (Fevrier-Mars 1918). The album was subsequently passed to his nephew, the French Diplomat and Pilot of World War I, Viscount Amédée de Flers..
revolutionary, Marxist thinker, founder of the Soviet Union (1870-1924). 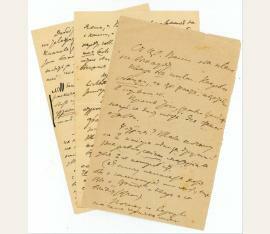 Autograph draft letters signed, written about the Zimmerwald Conference. No place or date. 8vo. Altogether 5 pp. and 2 lines on 3 ff. (some notes in copying pencil on p. 6 in a different hand). 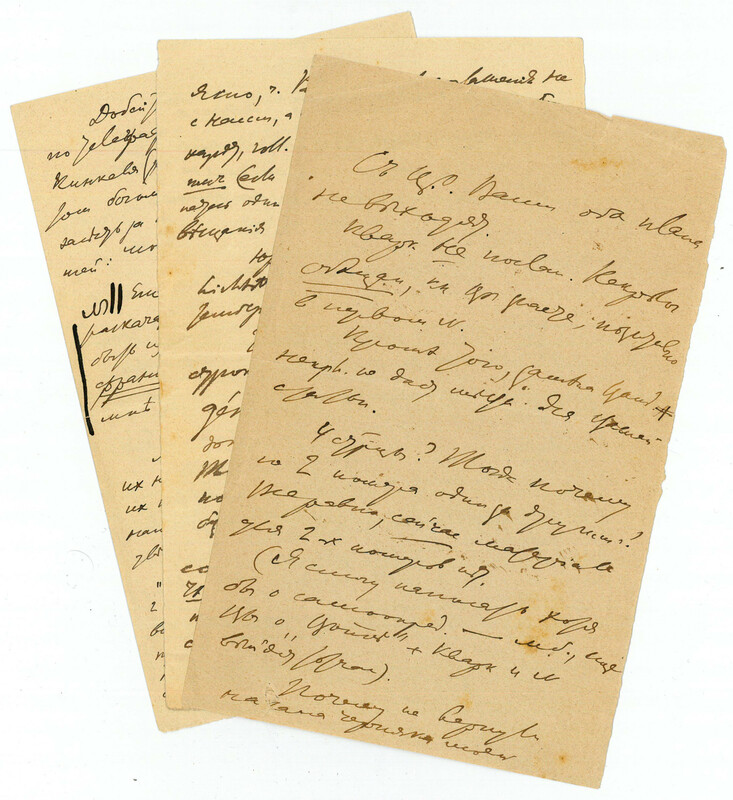 Important autograph draft letters signed about the Zimmerwald Conference, calculating how many votes the central committee of the Bolshevik faction will have at the conference, criticising Karl Radek's proposed address, of which he has a copy, for its lack of references to the fight against chauvinism, referring to Schklowsky, to the Swiss socialist Robert Grimm, and offering advice to his unidentified correspondent. - The Zimmerwald Conference, later to be called "the founding myth of the Soviet Union", was held at the "Beau Séjour" Hotel in Zimmerwald, Switzerland, from 5 to 8 September 1915. It was the first of three international socialist conferences convened by anti-militarist socialist parties from countries that were originally neutral during World War I. Among the 37 members were Karl Radek, Leo Trotsky, Grigory Zinoviev, and Lenin. With the Zimmerwald Conference began the unravelling of the coalition between revolutionary socialists (the so-called "Zimmerwald Left") and reformist socialists in the Second International..